50 AMP service cord that spools out and retracts at the push of a button. This is the original Cablemaster location. 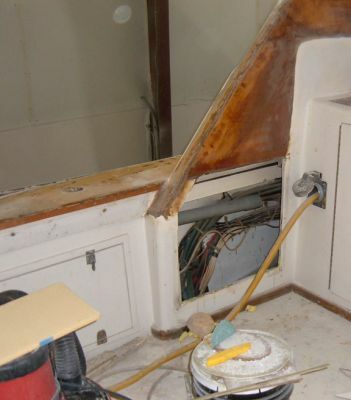 The cable will invarably need to run across the transom. While Cablemaster reels in and out with the push of a button making things much easier, the present configuration has the 50 amp cord dragging across the cockpit. 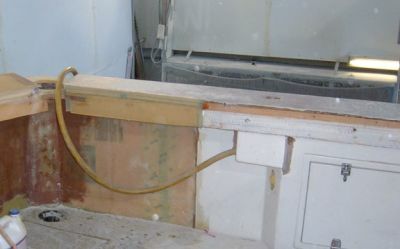 You can see how far the cable must lay to get across the transom. The new set up will utilize the newly installed box on the right side of this photo. 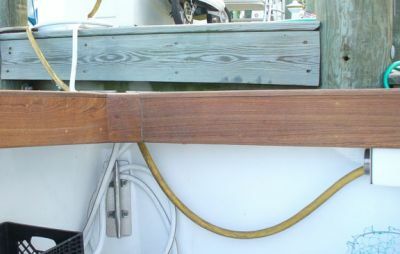 The cord will come out of this box and easily make the track to the hawse pipe in the corner without laying on the deck. I hate washing the deck only to have hoses or cords trap dirt until you move them and clean again. 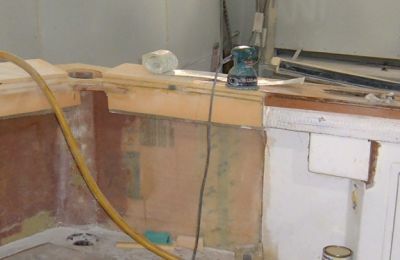 This box, on the starboard side, mirrors the box on the port side. With all of the additions there in now a need for a second 50 amp service. Naturally, we chose to install a second Glendinning Cablemaster. 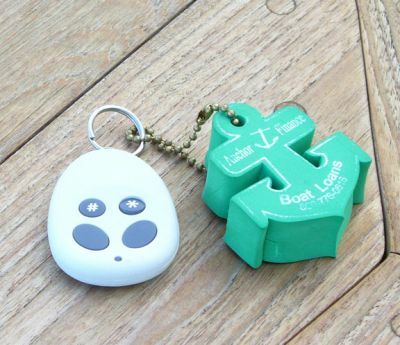 Cablemaster makes life much easier with the ability to reel a heavy 50 amp cable in or out with the push of a button. And it gets easier! Now that button location is on a remote. You no longer need two people just to dole out or pull in the cord. One person can handle the cord with the remote in the other hand. This remote can even be retrofitted to the older units. We now have the cable running where it should. It is about 4' from where the hawse pipe will be located and the 50 amp line will not have to lay on the deck. After the difficult work we accomplished running 2" cable pipe, we spoke to the Glendinning people and they told us that we needed to install rollers at least every 3 feet. We should have consulted them first! Dave is fixing the problem. 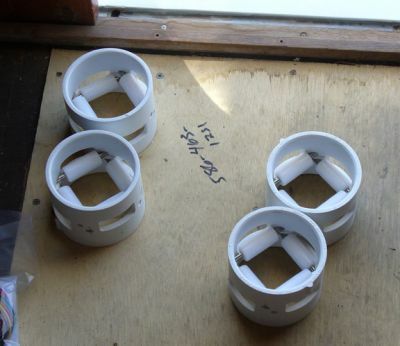 These rollers fit 3" schedule 40 PVC pipe. They help the heavy 50 amp cable make its passage. 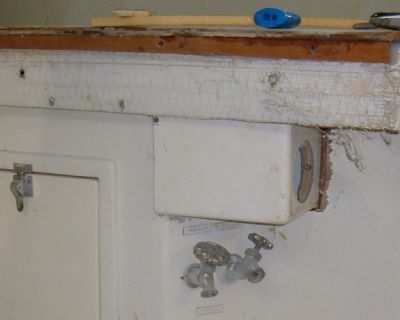 The original 50 amp Glendinning outlet has been moved so that it is 3' from the hawse pipe. As you can see, the cord no longer lays on the cockpit floor. 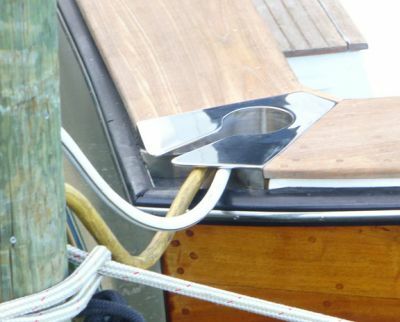 Now it is easy to run the cord through the hawse pipe and to the dock outlet. We added the second Cable Master to the starboard side. 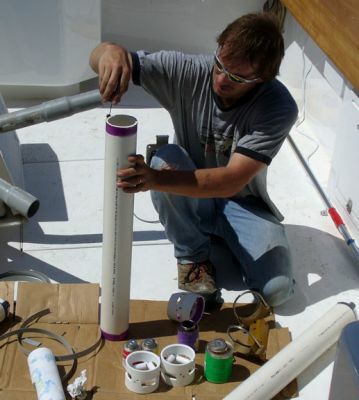 If we were to run everything on the boat, we would need both cords plugged in! However, during the majority of time one 50 amp is enough. 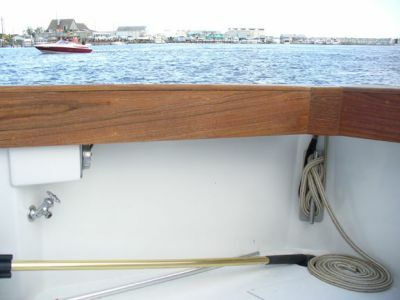 Having the cord on either side of the boat really does make it nice (even though we can run either cord depending on placement of the dock-tower). This remote control works both Cable Masters. The new unit came with provisions for the remote and the old unit was easily retrofitted. This is a very nice feature!